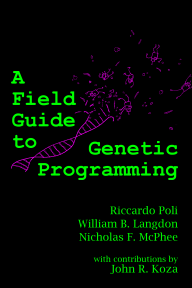 A Field Guide to Genetic Programming: Almost ready for EuroGP! We've ordered box or two of advance copies (a privilege of being the authors). They look really nice, and we're quite excited about the grand unveiling on Wednesday at EuroGP! For those of you coming to Naples, definitely stop by our table at the poster session that night -- you'll be able to check out printed copies and maybe even score a postcard featuring that wonderful cover :-). Whether you're coming to EuroGP or not, we'll be "turning on" the Lulu site Wednesday, so people can buy printed copies and download the PDF for free. 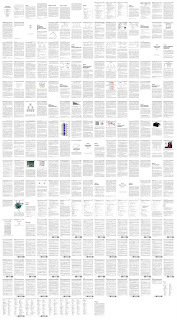 And as a teaser, the image above is the entire book, just really, really small! If you click on it you can see it a little bigger, but I still recommend waiting a few days for the Real Deal. The pdf download link isn't working for me. It's doing something but I'm too lazy to figure out what. The book won't be available for download or purchase until the official unveiling, Wednesday, 26 March 2008. That's just a few days from now, so hang in there!